I went to a community college production of "Of Mice and Men" this afternoon. Damn, I forgot how sad a story that is. The students were cast perfectly for their roles. Lennie was BIG, Curly was a small man, and Slim was quite slender. Even forgetting the exact plot, you knew Lennie was going to do something really bad, which he did. Then his friend George handles the situation himself rather than having Curly take pleasure in it. I really teared up at the end. The sexism and politically incorrect treatment of the disabled didn't seem to interfere with the transmission of the timeless themes. If my brain were functioning better, and perhaps I had had an English class in the last 25 years, I would name those themes. The actors carried off their disabilities well and with dignity, and the accents were consistently applied. Bruce Springsteen tunes were used as house and transition music; I'm not that familiar with him but it was his haunting, lonely type stuff and fit the 1930's setting well. These are my favorite birds at feeding time at the state park. Turns out it was pre-feeding time, but when we went to put the seed out the birds all fled. Did you know birds are so afraid of people? My favorite sign of spring is waking to the sounds of sneeder sneeder sneeder. As a kid I always thought these were sneeder birds. Later found out that is the sound of cardinals. Man, I love these birds. The males are the bright red ones, the females pale in comparison, the opposite of humans. I wish I knew how to control where pictures go on this thing. The photo on the left is a distorted picture of sister Betsy and me. I strained my neck and shoulder muscles in the shower this morning, it was very tense driving today, I have a lot of blog reading to catch up on, and I'm quite exhausted, so will call it a night. My boy has Mad Trumpet skills. Boy13 took on 3 contest pieces this year (first attempt). Solo, duet and quintet. He earned a first for each. For those non-band geeks: a first designates something like an A. You could receive a 1, 2 or 3. His solo judge was impressed with his musicality, ritardando, and tone, and stated he was "feeling the music." I'm so proud. This photo I took on my way home from Indiana. The roads were all clear, I saw this phrase that spoke to me, I turned around and snapped the picture. I just had my longest dry blog spell. It was totally unintentional. I have SO much news. First up, the reason for my absence: the short story, someone invaded my unsecured wireless service and changed the settings around. It took awhile to diagnosis it, but my wonderful internet provider patiently guided me to resolution just this evening. I am now "secure" and on-line again. (I think the kids are happy, too). Second, Ragged is a dear and sent me her homemade CD of Luv songs. It's great because it's a mix of new and old songs to me. I love Mandy, because it took me back to the feelings of sixth grade when Mandy was my favorite song. I don't want to stay there real long, necessarily. She included Lyle Lovett, one of my favorites, whom I saw in a great concert in Kentucky, her home state. I've really enjoyed this in the car and hope to add it to my Shuffle next week. Oh yeah, she warned me a couple of times that one particular song is not appropriate for little ones, so I preveiwed it, then promptly played it for Boys12 and 13. They weren't offended, but it wasn't really their style either. The past two weekends I have had to drive in adverse conditions for different reasons. Last weekend I met my sister at a state park in Indiana, traveling snow packed and blowing snow conditions. When the road actually got better (interstate) I passed 25 cars in the ditch on an 80 mile stretch. I guess they were not very good drivers, because I thought the conditions were improving immensely. Today I drove in freezing rain for two hours, to take my mom to a plane which was cancelled 10 minutes after we got to the airport. Turned around and brought her home, two more hours. There's a family emergency and she was trying valiantly to get to North Dakota. The picture above is a giant icicle we saw on a short hike we took. I was wearing some very uncomfortable boots, but it was worth hiking out a ways to see this. It helped my pedometer steps as well. I have gotten way off my walking and swimming plan this week. I'm disappointed and afraid I have lost my healthy ways. Too many meetings, classes, emergencies and activities this week. Correspondingly, I have been cranky, blue and PMSing the past two days. My mom helped me create these Valentine Boxes for the boys by taking apart a box obtained at a Stampin' Up party and cutting out a model. We share a number of rubber stamps and related supplies so I stamped them and she folded and put them together. Later I filled them with candy and added their names and mine. It was a busy day with stamping Valentines, eating too many corn muffins, making trips to Walgreen's for supplies, games of Diplomacy, and basketball. Unfortunately, there was more indoor activity than outdoor. After dark, the boys finally decided to play in the parking lot forts made from stacks of plowed snow, although it looks like Alaska, huh? And let us gently sleep with snow. When all the world is sleeping dear. And gently sip and start to muse. And hours to go in which to play. Did not get up in time (5:30 am) to go swimming (or so I thought). Could hear snowblowers and pickup trucks with blades scraping the parking lot next door for last two hours. Went downstairs to watch for school closing on TV. Not the best way. Hear Boy12 yelp. Check schools' websites. Kids school closed, Mr. D's college closed- wow it must be really bad. Looks like about 4 inches to me. No way my work is closing. Go upstairs at 6:30 to inform all they can stay home today. Boy12 says, "I know, heard on radio" by his bedside. Boy13 says "sweet". Boy18- forget it, he isn't due up for hours still. Mr. D has already showered and can't believe he has another day off (Lincoln's birthday yesterday). Phone starts ringing downstairs, and I listen to the answering machine when I get there. My work is closed. This is the true miracle. There have been two closing in 10 1/2 years, both this winter. I sort of prepared yesterday for Wednesday, and I'm glad I did. I am with the kids here, SNOW DAY SNOW DAY SNOW DAY!! That would give me a picture to take (big kids sledding or playing in snow), plus something to write about. I would be expected at work, but since the school I guest teach in would presumably be closed, I could probably take a half day and come home for the afternoon. Fun. Has anyone west of the Mississippi seen this so-called snowstorm yet?? We had a doosey on Dec. 1st. The biggest snow I remember in 10 years in Illinois. Of course, nothing compared to my Buffalo, NY days. They are really getting it now and even back in October- a terrible ice storm that snapped so many trees and power lines. Tag03 (aka Not Hamlet): at least write something on your blog so I can begin to guess your identity or at least an inkling of your personality. Uh, I've gone blank, are there any good love songs out there? All songs have special but personal meanings to me. I don't know how to burn a CD, but I am hoping to get an Ipod Shuffle clip-on for my birthday and have my kids help me download my songs. Mr. D. and I have been breaking out in song far too often (we can't carry a tune). We sound a little like the Sweeney Sisters from Saturday Night Live. Each time I look in "My Pictures" I find strange things have appeared. Like this picture of what was labeled "hipster van". Apparently, this is what Boy13 is hoping to get for his 16th birthday. Luckily, we have two more years to prepare. Call me unsavvy, call me uncool, whatever. I have no idea how to post a you tube video on my blog (I tried to follow the instructions to no avail). Well, here's a link to a really cool musical selection. Boy13 says, 'This guy has mad skills' and now he wants to borrow grandpa's ukelele. Also, Randy Jackson on American Idol said 'mad skills' tonight on AI, so I guess that's now an overused phrase. I nearly made myself sick on sweets tonight, candy hearts (tart) and chocolates with fudge centers. I was packing some V-Day treat bags for 'my girls' in middle school. I'm going to try to write personal valentine notes to each noting their unique qualities. I discovered my pedometer has been ripping me off. When wearing it on my waistband, I get about half the steps I get when I attach it to my sock. And I thought it was just the dirty, rotten weather that was killing my step goal. This has been three weeks of declining steps, and now in the last three days, I am skyrocketing. Fact is: I walked what I walked regardless of what the ped said. I know, but I am hung up on goals, and measurements! Took my second chapter test in statistics this evening. It was fun. I like making histograms, frequency polygons, ogives, pie graphs, scatter plots, Pareto charts and time series graphs. Even though most of these are never used, and I will forget the formulas, simple as they are, tomorrow. There is no midterm and no final in the class, thus I really only have to retain the information a week or two at a time. Good for middle age students :) Perhaps I should put my step data into a time series graph. Enough of random thoughts, and it's off to bed. My eyes are killing me, and my stomach is not much better. Now I know I am living a little too much in blogger world. 9:52 p.m. after the Superbowl, one vote of confidence in the Chocolate Duo from Eli. Good for dipping apples in. These fancy pictures I took of t-shirts I found in the laundry. I bet you're thinking of the two, the second is from my generation, and it is. And Peeps technically are Easter food from my childhood as well. But actually they are both t-shirts of my boys age 12 and 13. They both love the Beatles, and have many, many of their songs on their I-pods. I had nothing creative to say this evening, but still wanted to say something. So I looked to my picture collection for something to inspire me. Well, here it is. 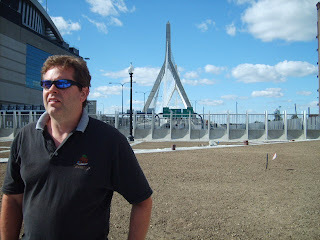 This is my big brother, Chris, last September in his fave city, Boston. In the background is the new Leonard P. Zakim Bunker Hill Bridge (had to look that one up), part of the "big dig" which was I guess was a big, bungling mess. 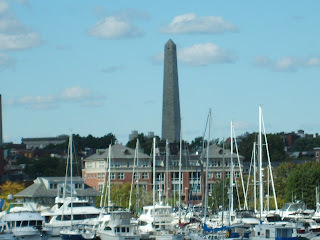 Anyway, this bridge was designed to mirror the shape of the Bunker Hill monument (top photo). Nifty, huh? To the left of Chris is the new TD Banknorth Garden. I'm having a bit of confusion here, but I think this replaced the Boston Garden, also known as the Fleet Center. I do remember Chris explaining that the new arena was built about one foot from the old building, which was later demolished. Chris enjoys all this construction trivia, as he is a civil engineer in the area, working with pre-cast concrete. He can talk about a parking garage forever. I have probably screwed this all up, but I'm a social worker, and wasn't paying that much attention, nor do I have the patience to research it all. A friend from Connecticut turned me on to some beautiful products from Haiti. A friend of a friend who was a nurse started a project in Haiti to help the women in a village there make some money to sanitize their water, educate their kids, etc. They make beautiful embroidered pillowcases, table runners and nightgowns out of 100% cotton. I have one nightgown and it is my favorite one ever. They are really exceptional items, and reasonably priced. I am sure this is all on the up and up, and the website is accordingly very low budget. 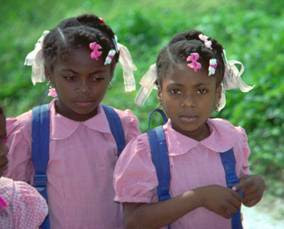 You can find out more at www.haitiprojects.org. Boy 12 got 8th out of 25 in the school spelling bee against 7th and 8th graders. He had to take a guess at "hearth," never having heard of it. Phonics didn't work on this one. I was just doing my nightly cruise around the blogs (when I should be cruising around the BLOCK or at the Y doing laps around the track) when I noticed profiles contain one's Chinese zodiac year. I went back to check my profile, since I've always liked being year of the rabbit. Two astounding things then happened. I noticed it said my year was RAT. That would be my last pick, as if one could pick, and I realized I had lied about my age. I thought I said I was 25 (I guess hoping that more people would look at a 25 year old), but it now said 250! Okay, I went to edit and saw my birth year was 1756, and the zodiac year automatically corresponds. Anyway, I fixed that, and now you will know I am 43 and proud (sometimes). The other surprise was that I had been stuck on 95 profile views forever. Today there were 121. I am so happy, even though only three have commented. This is getting more fun (and addictive) everyday. Now I have to find a picture. 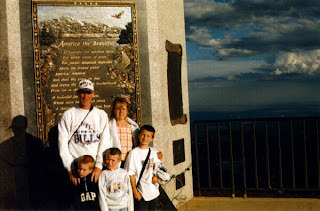 This is all my boys and me on Pike's Peak in 2000. It was a traumatic ride up on the train, between my youngest being struck with a terrible stomach ache and my husband looking over the edge of the mountain saying, "I didn't know it was going to be like this," and battling vertigo.